Talk about sanctification is dangerous. It is too seductive for the old being. What seems to have happened in the tradition is that sanctification has been sharply distinguished from justification, and thus separated out as the part of the “salvationing” we are to do. God alone does the justifying simply by declaring the ungodly to be so, for Jesus’ sake. Most everyone is willing to concede that, at least in some fashion. But, of course, then comes the question: what happens next? Must not the justified live properly? Must not justification be safeguarded so it will not be abused? So sanctification enters the picture supposedly to rescue the good ship Salvation from the shipwreck on the rocks of Grace Alone. Sanctification, it seems, is our part of the bargain… The result of this kind of thinking is generally disastrous. 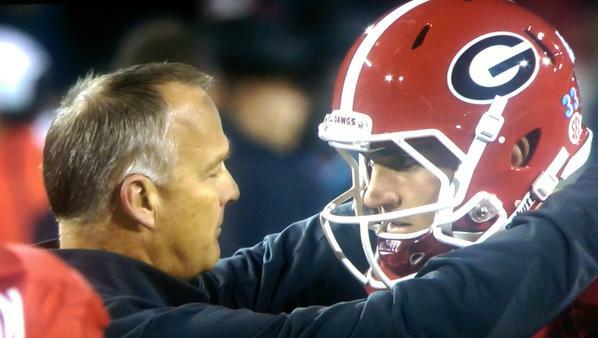 The Georgia Bulldogs came into yesterday’s game with something to prove. After suffering a humiliating loss to Alabama two weeks ago, and losing Heisman candidate running back Nick Chubb to a gruesome knee injury in last week’s loss to Tennessee, Georgia faced a home matchup with the Missouri Tigers, who have won the SEC East two years straight and entered yesterday’s game with the top passing and scoring defense in the conference. Georgia’s hopes of catching up to current SEC East leader Florida rode on the Dawgs’ ability to come away from yesterday’s game with a W.
The game was low-scoring and tight, with both teams failing to reach the endzone. With 5:40 remaining in the game, it fell to Georgia kicker Marshall Morgan to put the Dawgs ahead by making a routine 24-yard field goal. He sent it wide left. Four minutes later, with the score tied 6-6, Marshall was given another opportunity to put Georgia ahead, this time with less than two minutes to play. Marshall Morgan went out and kicked a 34-yard game-winning field goal. Georgia snapped a two-game losing streak. And the Bulldogs got their first win without a touchdown in twenty years. There’s something I’ve found to be true about people – when confronted with the pressure to meet a standard of perfection, we don’t. We simply can’t. We can’t possibly meet every deadline, check every box, or produce at a high level at all times, and we all live with the constant awareness that we can’t do everything right. It affects every aspect of our lives, from our jobs to our relationships, and the exhortation from bosses, spouses, parents, and pastors to “shape up, try harder, act right, be better” is of no comfort to anybody. In fact, it’s more like a cruel joke. This is because The Standard of Perfection can’t produce in us what it’s asking of us. As long as there’s scorekeeping involved we will fail, and even well-meaning people who encourage us to work hard to improve plant seeds in our hearts that grow into forests of condemnation. There’s only one solution to our dilemma: we have to unplug the scoreboard. The only way to win is to refuse to play the game. That’s what grace makes possible. Where The Standard says, “If you produce I will love you, but if you don’t produce we’re not going to get along,” Grace says, “I love you no matter what.” And, as it so happens, the environment of Grace is a greenhouse where growth can actually occur. If you’re a leader, a boss, a parent, or a pastor, you have to understand this. How you react when your employees, followers, or children fail to meet The Standard is of critical importance. You have to choose now to turn off the scoreboard. You have to choose now to say to your people, “I love you no matter what,” and mean it. Recently I’ve found myself revisiting my highlights and notes on John Lynch’s magnificent book, The Cure – a book I read last year that profoundly transformed my relationship with Christ. One section has been especially moving to me this week. In a series of bulleted questions, Lynch offers a diagnostic for sorting out whether our relationship with God is one of shame, or one of grace. I hope you find these as helpful, and as encouraging, as I have. Do I measure my closeness with God by how little I’m sinning, or by my trust that, to the exact extent that the Father loves Jesus, the Father loves me? Do I see myself primarily as a “saved sinner,” or a “saint who still sins”? When I talk to God, do I spend more time rehearsing my failures or enjoying His presence? Am I drawn to severe authors and preachers who challenge me to “get serious about sin” or those who encourage me to trust this new identity in me? Am I drawn to messages telling me I haven’t done enough or those that remind me who I am so that I’m free to live out this life God’s given me? Do I believe that one day I may achieve being pleasing to God or am I convinced I’m already fully changed and fully pleasing? Is my hard effort spent preoccupied with sin or in expressing and receiving love from others? Do I trust [spiritual] disciplines to make me strong or grace to strengthen me? Do I believe that God is not interested in changing me, because He already has? Do I read the Bible as “You ought, You should, When will you?” or as “You can, This is who you now are”? God has shown all of His cards, revealing breathtaking protection. He says, in essence, “What if I tell them who they now are? What if I take away any element of fear? What if I tell them I will always love them? That I love them right now, as much as I love my only Son? ‘What if I tell them there are no logs of past offenses, of how little they pray, or how often they’ve let me down? What if I tell them they are actually righteous right now? What if I tell them I’m crazy about them? What if I tell them that, if I’m their Savior, they’re going to heaven no matter what – it’s a done deal? What if I tell them I actually live in them now, my love, power, and nature at their disposal? What if I tell them they don’t have to put on masks? that they don’t need to pretend we’re close? I’ve never been one to hate on New Year’s resolutions. I realize that they carry the stigma of being unrealistic or inconsequential. But I believe in the power of a purposeful resolution. You can find them in the Bible, too: Ezra “set his heart to study the law of the Lord and to practice it, and to teach His statutes and ordinances in Israel” (Ezra 7:10). Daniel “made up his mind that he would not defile himself” (Daniel 1:8). The book of 2 Chronicles even shows us that failure to make these sorts of resolutions can have negative consequences. “Rehoboam…did evil because he did not set his heart to seek the LORD” (2 Chronicles 12:13-14). Resolutions are the first step toward real change. Without them to serve as guides, we’re left to drift, with little more than weak hope we will ever become the kind of person we want to be. We need concrete goals, things that we can set our heart on, to strive for and grow toward. So here are my belated New Year’s Resolutions for 2015. 1.) Rain on fewer parades. I’m wired to recognize cons before I acknowledge pros, so if I’m not intentional about identifying the positives in a situation I’ll lean toward skepticism, even cynicism. This is something I want to take more steps to correct this year. 2.) Take every opportunity to celebrate the success of others. This one has a lot to do with the first one. I have all sorts of reasons why I fail to do this. Sometimes it’s because I’m too busy thinking about to myself to recognize and praise the work of others. Other times I’ll recognize the great things that other people are doing and I’ll compliment them behind their back to others and neglect to actually give them the direct props they deserve. 3.) Memorize an entire book of scripture. I was going to do this last year with Philippians and fell off the wagon after the first chapter. Picking it back up again this year. 4.) Learn to be comfortable with spending time alone. People who know me personally are always shocked when they find out I’m a high extrovert (over 80% on the MBTI). I’m drained by huge groups of people, but I’m energized by spending time with a select few. Since leaving Austin six months ago, I’ve had a lot more time to myself, and I’m still trying to adjust. 5.) Take a long road trip. Because who doesn’t love one? That’s them. I tend to try and limit my resolutions lists to five. It’s a good manageable number. I can remember them all. I also like to mix personal development goals with big things that I want to do. I find it’s more fun that way. What are your resolutions? Feel free to share in the comments below. Halfway through the first chapter of The Reign of the Servant Kings I felt the way I imagined David Bazan felt as he wrote the first lyrics of what would eventually become Curse Your Branches, his musical “breakup letter to God.” It wasn’t God I was breaking up with – it was reformed theology. I used to be reformed theology’s biggest advocate. I’d figured out a way to ignore all the questions I’d never found answers to. Questions about anthropology, and eternal rewards, and the relationship between grace and works. Reading The Reign of the Servant Kings I found answers to some of those questions. I also found more questions. One thing was for sure: I could no longer accept five-point Calvinism as a satisfying summation of the Christian experience. 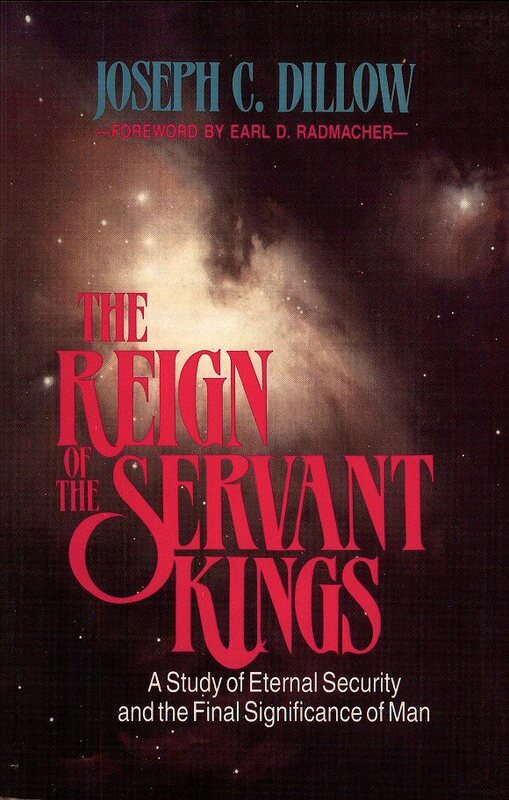 The Reign of the Servant Kings is out of print, but it’s been expanded and re-published as Final Destiny. It’s well worth the months it will take you to read it. I’ve always liked Erwin McManus, but I’ve always felt like I never quite understood him – that is, until I read this book. 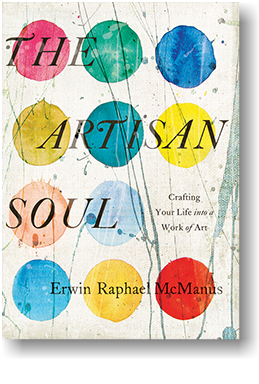 I read the Artisan Soul in one sitting, feeling in over my head and totally depressed after moving from Austin to Dallas, knowing no one, and starting seminary. And for what seemed like the first time in a long time, I couldn’t stop smiling. Capon uses the story of an extramarital affair as source material for a meditation on grace. And it’s staggering. In a whirlwind of thought that defies explanation, I fell in love with Jesus all over again, reminded that grace that isn’t scandalous isn’t grace at all. 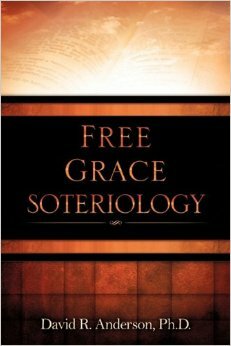 Free Grace Soteriology was the first book I read after reading The Reign of the Servant Kings. So many questions answered. So many troubling passages addressed. A systematic dismantling of “Lordship Salvation” – the cruel slavemaster of a belief system that backloads the gospel with works. I found freedom in these pages. I really enjoyed Taleb’s earlier book The Black Swan, despite understanding maybe a fifth of it. 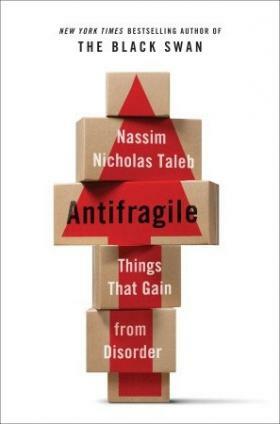 Antifragile is better in every way. 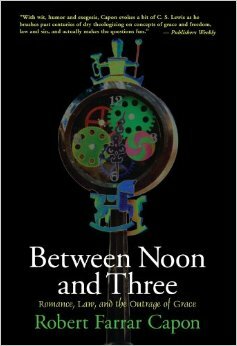 I applied some of the concepts from this book to fantasy football and made it to the playoffs as the number four seed in a twelve-team dynasty league. For whatever that’s worth. What were your favorite reads this year? Feel free to comment below.